I had no idea when I typed those words in that beside the recipes with gluten free flours, there would be a constellation of recipes I could make entirely without flour, from such staples as quinoa, millet, sweet potatoes, oats and yes, even black beans and lentils, and that all of these were oil free, and some were fat free as well. I jumped right in to experiment. 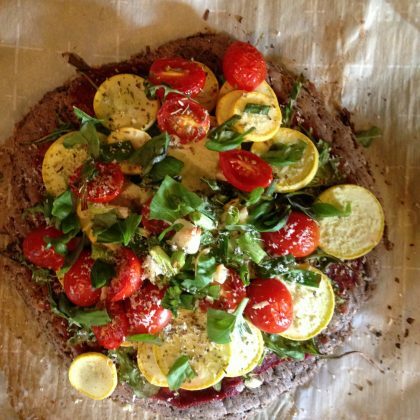 The first one I tried was simplicity itself: Savy Vegan’s Two Ingredient Quinoa Pizza Crust. It’s literally 1 cup of raw quinoa and 1 cup of water, blended. You can add any spices you want. It worked even in my no frills Osterizer. If it worked with quinoa, why not millet? And I was off to the flatbread pizza crust races. I read other recipes, too, ones that said to soak the quinoa, soak the millet. I tried that as well, but ultimately it doesn’t seem necessary. I came up with one that combined millet, quinoa and cooked potato, inspired by this sweet potato oat pizza crust from Vegan Nomad Chick. 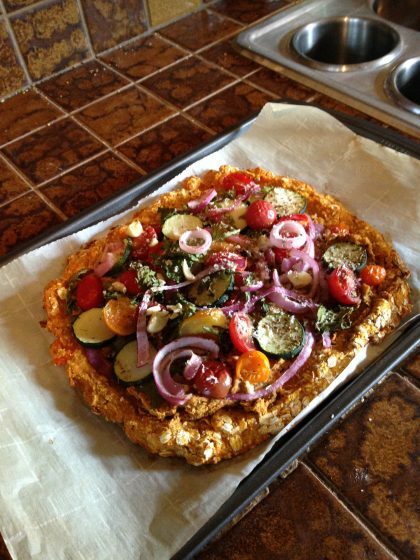 There are many recipes for red lentil pizza crust, but since I didn’t have any red lentils I tried versions of this one from Vie de La Vegan for brown lentils. The jury’s still out on that. between tbs-1/4 cup of ground golden flax seed. Preheat oven to 425. Line a baking sheet with baking parchment. Place the spread batter into the oven and bake for 15 minutes. Take it out and flip it over like a large pancake. I just loosen it all around with a spatula and then slide it under and flip. It’s worked every time I’ve made any of these pizzas, and by now I’ve made at least a dozen, if not more. This one with the beans is a little more precarious, but it still flipped. If you’re afraid of doing that you can try Sweet Potato Soul’s need trick for flipping hers, which does not have any millet in it. I think the grain gives the crust body and helps to flip it the way I did. Bake ten more minutes. Take it out and spread your sauce and toppings on. The sky is the limit but on this particular crust I made my tomato paste like barbeque sauce, adding a little vinegar, date paste, garlic and lots of smoked paprika. Then I put some baby arugula, some sliced yellow squash, sliced in half cherry tomatoes, chopped garlic and seasonings of choice. Put it back in the oven for 5-10 minutes to let the topics warm and cook. Take it out and tear fresh basil over the top. Grate a cashew over it for fun too. 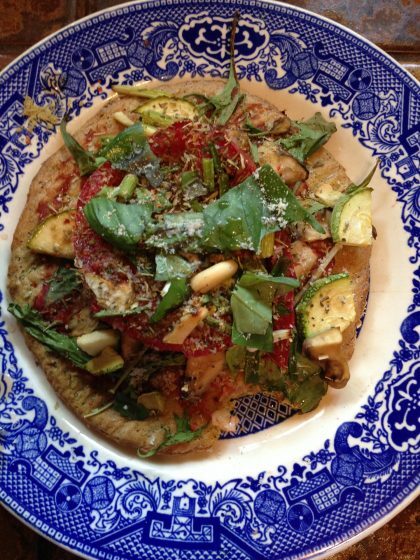 And get ready to enjoy your very own gluten free flatbread pizza party. I hope you have as much fun exploring these videos and pizza crusts as I did. Nothing like pizza to make a meal a party!